We’d all been looking forward to this day for quite along time. Aunt Carrie and Uncle Steven first reminded us of Rylee’s special day way back when we still lived in our kennel in Connecticut. Back then we weren’t sure where in the country we’d be living, we just knew there was no way we would miss it! Oh and the Torah service, that was cool…up at the front they had this big closet. I thought for sure we were supposed to hang our coats in it but when they opened it and pulled out these big scrolls of paper I was beginning to think we’d be wrapping gifts until they started reading from them. I was really surprised that Rylee could read Hebrew and recite all the passages. Aunt Carrie and Uncle Steve told us that she had been practicing for a really long time, like from early Summer. All the practicing payed off, she really did a great job! She spoke so eloquently about life lessons that we all could take to heart. After the service there was a gathering for sniffs and pets. (The humans ate and talked.) There was a group of kids that asked Mom earlier if they could pet me, but I was working so we had to decline. During the lunch gathering though there was an open corner and Dad was sitting and talking with his cousin so Mom and I went and met the kids. We all had a great time! Soon enough though it was time to go. We went back to the hotel to relax a bit. (I got some bed cuddles with the human puppies, some dinner and a walk. Later the same night it was time to P-A-R-T-Y! We got all dresed up. Mom and the girls looked so pretty. Dad, well there isn’t much we can do there, but he did put on a suit and Bow-Tie (…because bow-ties are cool!). We walked through the building that was hosting several events that night. We dropped off the kids for their events on the lower floor while Dad, Mom and I went up to be with the adults for drinks and hor d’oeurves. Grandpa kept trying to give Dad wine, but after he said he wanted to pay attention to the other guests without a glass in his hand it made sense. 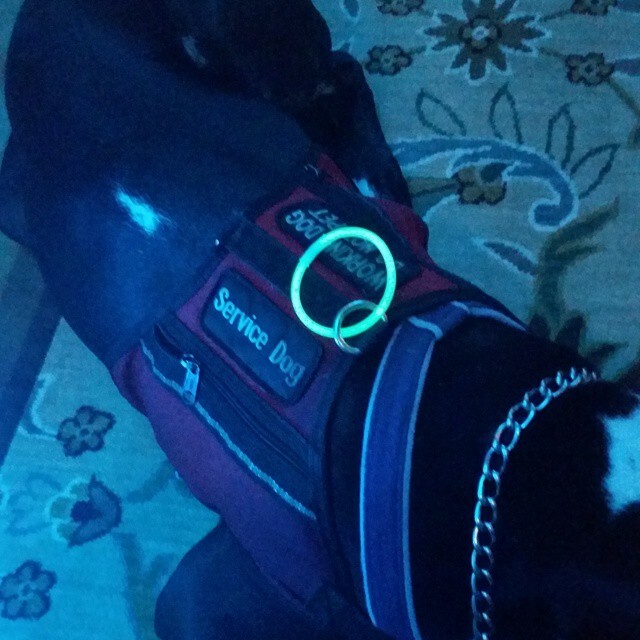 I slept through most of the party, but Lily didn’t want me to be left out and gave me this glow bling! The next day we did have to come back home, so it was back to the airport, waiting in lines and long naps on the plane, and who could forget the horse jokes. I really had a great weekend and we can’t wait to see everyone again. I hope it isn’t as long as it had been for Dad, but at least I have my second cousin’s Bat Mitzvah to look forward to in a couple years! Thank you so much for sharing your trip to CA. What a great time, meeting new relatives, new people, new experiences. You made it come to life. Of course, Casper, we expect nothing less than outstanding performance by you ’cause you are and SDP Super Secret Service Dog. Big hugs to you and your people. Love you, my Little Ghost.